GERMS: YOUR PROGNOSIS ISN'T PRETTY. WE DON’T JUST KILL BACTERIA. WE TEAR THEM FROM FLAGELLUM TO FLAGELLUM. Our secret weapon? 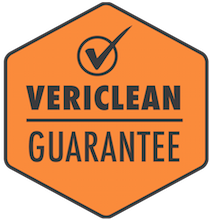 The VeriClean™ audit system. It ensures that germs can’t hide from our cleaners, and we’re the only company that audits to this degree in medical offices. Auditor applies fluorescent spray to every inch of an area that needs cleaning. Our cleaning team disinfects the area. Auditor shines a black light on the cleaned space, revealing any missed spots. Results are logged electronically, allowing us to ensure that every client's needs are met. THESE AREN'T JUST CLEANING SUPPLIES. THEY'RE WEAPONS OF MASS DISINFECTION. With patient health at stake, we take extra precautions to keep pathogens in their place. For example, we make sure that our microfiber rags are always sealed, separated and sanitized to prevent cross-contamination. 99.999% of common pathogens are killed in the laundering process. Rags are transported in closed containers to prevent bacteria from mobilizing. Laundering meets OSHA, CDC and Joint Commission infectious control standards.